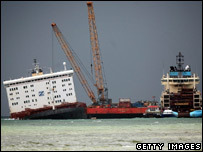 Attempts are being made to break the stricken container ship MSC Napoli in two in east Devon. The container vessel was rebeached on Thursday after earlier being refloated when a diving survey revealed it was more severely damaged than feared. The vessel was rebeached at high tide on Thursday and is now lying just a short distance from where she has been stranded for the past six months. The ship was originally grounded in January after being damaged in storms. Salvors have been working overnight to remove ballast in an attempt to facilitate a controlled break-up of the vessel by causing the hull to sag. Toby Stone, from the MCA, said that if the operation works it would leave the bow section afloat which could then be towed away and the stern would sink to the seabed and eventually be removed. "The bow is already high in the water and the salvors are hopeful this will work today," said Mr Stone. An East Devon District Council spokesperson said there was disappointment that the refloating option had not worked. "However, we appreciate that the Secretary of State's Representative had no choice but to bring the ship back closer to shore, given the fragile condition of the hull," the spokesperson said. The council said it would continue to monitor the situation closely.